The lands of the Bible in this region has four longitudinal zones. There is the Coastal Plain, the Central Mountain Range, the Rift Valley and the Transjordan Plateau. However, there are a few smaller areas sandwiched in between those primary zones. One of the is the Shephelah. The Shephelah is a small area within the land given to the tribe of Judah with a fertile, rolling plain. Even today, there are plenty of crops growing all over this region. For our interest on this tour, we are interested in the Biblical events that occurred in this area. We started our day by driving to the Sorek Valley, the stomping grounds of the judge Samson. The site at the eastern end of this valley is Beit Shemesh. We stood at this site and could envision Samson tying the foxes together and setting the fields ablaze. Also, we could see the milk cows dragging and cart behind them carrying the Ark of the Covenant. Our next stop was at the Valley of Elah. After you visit this beautiful valley, you will never read the story of David and Goliath the same again. I am continually impressed by the geographical accuracy of the Biblical writer in telling this story. We stood in the valley and reread parts of the story describing those details. Afterwards, everyone went down into the brook to pick up some "small smooth stones" to take home. Lachish was next on our list. Seeing this site helps you understand its strategic importance. You can still see the siege ramp built by the Assyrians as they captured the city. The dig season for this site is going to be starting in about a week. We could see the people beginning to move equipment into place in the gate area. I look forward to hearing what they find. After a bit of a drive, we found ourselves at Beersheba. This site sits on the northern edge of the Negev. This is a beautiful site and easy to walk around and see. They have built a tall tower to view the landscape and we had the opportunity to walk through the water tunnel. Our final stop of the day was at Nebi Samwil, just north of the city of Jerusalem. From this vantage point, you can see the Benjamin Plateau and overlook the city of Gibeon. The sun stood still here at one time, but not today. We took our pictures and then headed toward the hotel. Our tour is quickly coming to an end. We have one more big day tomorrow before heading to the airport to catch a late-night flight. As I type this, I can hear the songs of the evening call to prayer for the Muslims. 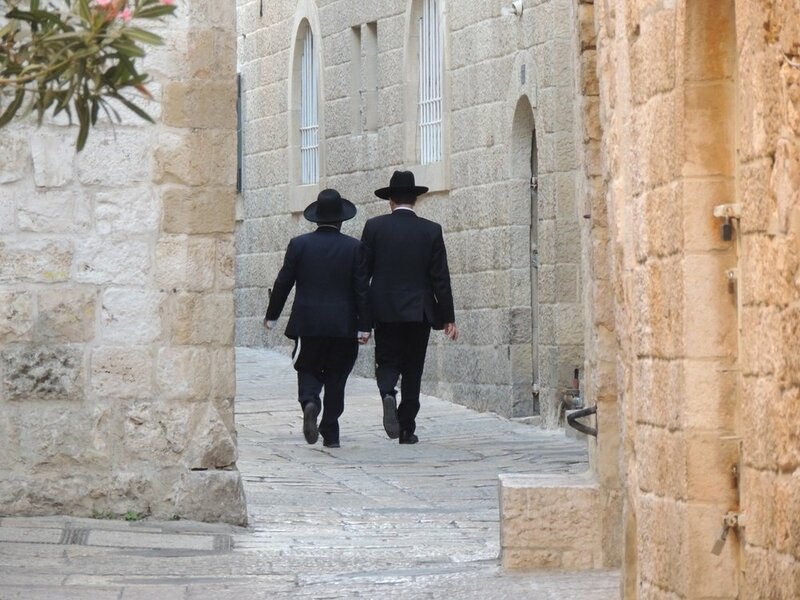 And, I can look out my hotel window and see the Jewish people walking home after finishing their prayers by the Western Wall. I'll try to post tomorrow night, but time and Internet availability my limit the opportunity. But, I'll be back online soon. In the article, there is a fantastic picture of a casemate wall from the city. I tried to find the same picture on the Internet with no luck. However, I found a similar picture that I have included at the top of this post. (NOTE: If you are reading this post from an email, you might need to click on the title and view the post from the web to see the picture.) In the center of the picture, you can see a four-chambered gate which led into the city. However, along the edge of the city walls, you can see a series of small rooms very similar in size. The walls in these small rooms were thicker than normal walls. During peace times, the inhabitants of the city used these small rooms for storage. However, if the enemy decided to attack, these rooms could be quickly filled with dirt, rock and other debris, which would make the city more secure. Thanks to the real archaeologists and their teams of volunteers, we can learn so much more about the land and the people in the Bible. And, by learning more about the land and the people, we can learn more about the Bible. I have got to figure out a way to participate in a dig in the near future. Credit: The picture at the top of the post comes from the Israel Antiquities Authority website.